CSI Closets & Storage offers full closet design, closet remodeling, garage remodeling and installation services for your new storage components. In addition, if you require demolition of your old closets, wall repair, painting or other services prior to the installation, please ask us about our Handyman Services Division. Our storage space is at a premium. And we seem to accumulate more stuff than we have room for. Where to keep it all? More things can be stored in the same amount of space if it is well planned. Good planning begins with an assessment of things to be stored. 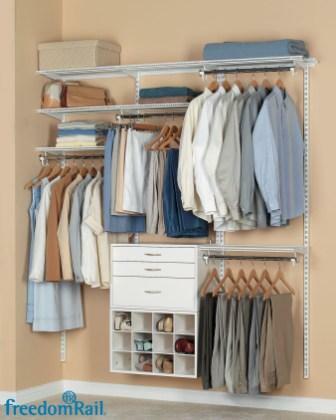 Here are some clothes closet planning tips to consider. A shared closet can become a jumbled mess unless there is some sort of clear division. As we know, women usually have many more items of clothing than men, and therefore, need a little more room. Women need some double hanging space as well as long hanging rods to accommodate dresses, robes and long coats, while most men's garments only need double hanging rods. Women also need more shelves and drawers for bags, shoes, and accessories. One day take everything out of your closet. Go through things piece by piece and decide what stays and what goes. Give away or discard items that don't fit or haven't been worn for at least 3 years. Now while the closet is empty, take your measurements. Click here for a how to measure diagram. Put everything back deciding whether an item should be hung or folded. Make a count of how many short hanging items you have, how many long hanging items, how many pairs of shoes, how many ties, etc. Click here to fill out the appropriate survey form. Do the same for every family member. Remember, adjustable closet storage grows with the child from toddler to teen. In other areas like the pantry, laundry room and the garage, take the same sort of inventory. What special items do you need to store or display? There are special wall racks, baskets, shelves, hooks, and cabinets that can tame all of your tools, paint cans, brooms, home office supplies, craft supplies, bicycles, sports equipment, holiday decorations, garden equipment, pet supplies, care care supplies, and much, much more! Your CSI designer will use your information to design a closet storage plan that will incorporate the components that you need specific to your requirements. Our own experienced, licensed and insured installation staff will install your new closet components or system.